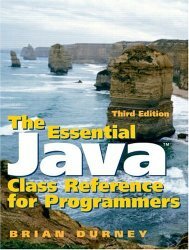 This third edition of The Essential Java Class Reference for Programmers is an easy to use, very concise and inexpensive tutorial/reference to the key class libraries used for everyday programming. The new edition has been updated for JSE 5.0. Chapter topics include Java class reference, complete examples, an HTML tutorial, Java programming glossary, and error messages with explanations. The book includes an interactive website tutorial with examples showing how to use the libraries in Java programs. For use as a reference by professionals working with Java programming and language.